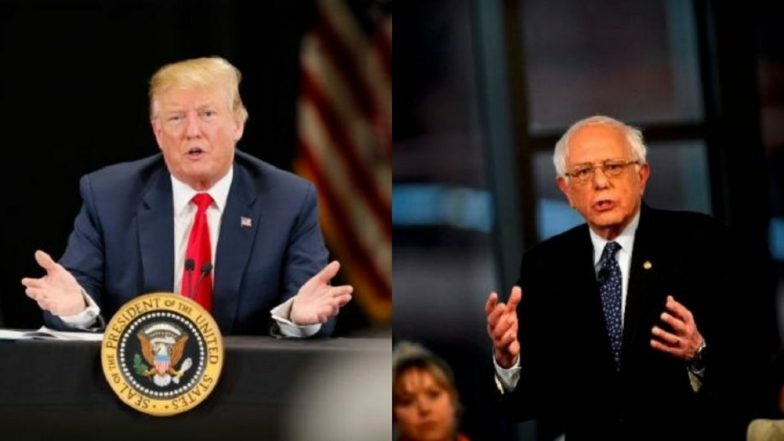 New York, April 16: The two aspirants for the party nominations for the 2020 presidential elections from the two extreme ends of the electoral spectrum, US President Donald Trump and self-described socialist Bernie Sanders, are leading the race in poll fund-raising. According to their campaign finance filings for the first quarter, Trump's war chest is about $30 million, while Senator Sanders, vying for the Democratic Party nomination, has collected $18 million. Senator Kamala Harris is behind them with $12 million, followed by Beto O'Rourke with $9.4 million, Pete Buttigieg with $7.1 million and Senator Elizabeth Warren with $6 million. O'Rourke, a former Representative, was defeated in his Senate run from Texas last year, while Buttigieg is Mayor of a small university town in Indiana state. But they have received a lot of positive publicity in the media. Fund-raising is considered a sign of popularity and is one of the markers for selecting participants for the Democratic Party's televised debate among candidates starting in June. US Senator Bernie Sanders Releases 10 Years of Tax Returns. Former Vice-President Joe Biden, leading the opinion polls for the Democratic nomination, is yet to officially announce his candidature and has not raised funds. The 16 Democratic Party candidates, for whom the filings are available, have together collected about $80 million, which is far higher than Trump's election haul. But they suffer a serious handicap against Trump. The Democratic candidates will be using most of their funds till the middle of next year to fight each other during primaries to be anointed the party candidate at the convention in July 2020, rather than Trump. About 20 candidates are vying for the Democratic Party nomination. Trump has a huge advantage because he does not have a serious challenger for the Republican nomination -- and, if none emerge, he will not have to spend funds on the primary, leaving him with a larger pool for re-election campaign. Whatever he spends during primaries will, in effect, also contribute to building his image for re-election. His fundraising also displayed his continuing attraction among middle class and working class Americans. Although Trump is perceived to be aligned with big business, he got nearly 99 per cent of his funds from individuals contributing $200 or less, with the average being under $35. Like Trump, Sanders had a strong showing with his base that is almost similar if politically polar opposite. He has received 84 per cent of his funds from people sending less than $200, with the average being $20. The average size of Harris' donation was higher than the other two at $55. She is from California and is a favourite of Hollywood, according to Politico. She received $2,800 from Ben Affleck, $5,600 from Elizabeth Banks and $5,400 from Eva Longoria Baston, according to Politico. Harris is the richest, according to her tax returns, which showed an income of $1.9 million last year. Senator Elizabeth Warren came next with $846,000 and Sanders with $516,000. Sanders, however, crossed the million-dollar mark in 2016. He made most of the money from royalties for his book, "Our Revolution: A Future to Believe In", earning $2 million over three years. Sanders, who promotes himself as a socialist and the common man's candidate, was unapologetic about his wealth. He said on Monday on a Fox TV programme: "If anyone thinks I should apologise for writing a bestselling book, I'm sorry, I'm not going to do that". Harris also made money off her book, "The Truths We Hold", a memoir. She reported earning $733,000 from it last year.